This is the latest idea that we had for TDP.ie. It’s basically aiming to show people the wide range of cars that we have on the Dynapack on a daily basis. Obviously, we won’t be able to update the page everyday, but we will try to update it at least every few days. 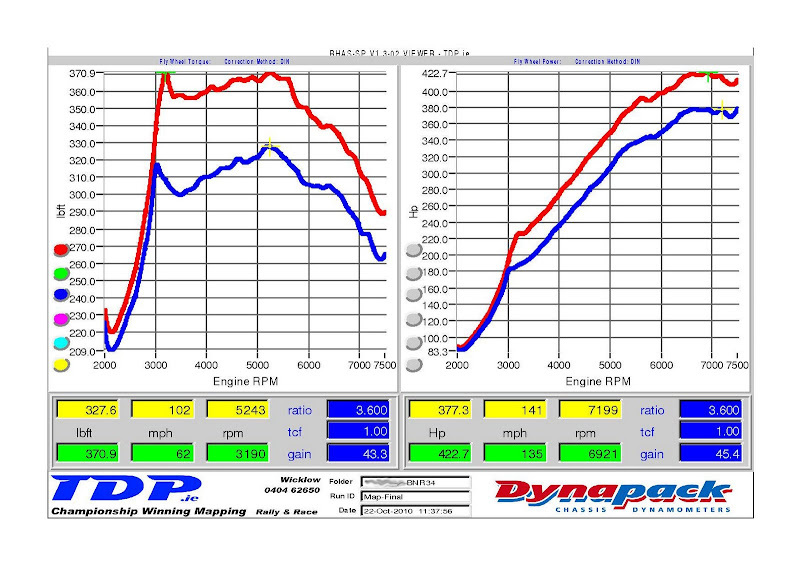 Here are the results for an EVO VIII we had in for mapping today. This car is completely standard apart from an after-market back-box. We mapped it for him on the standard ecu. The first image shows the torque (lbft) on the left hand side of the page, and power (BHP) on the right hand side of the page, measured at the hubs. The torque figure is the ‘true torque’. It is calculated by: the torque produced at the flywheel multiplied by the gear ratio and the final drive ratio. The power figure is the power produced at the axles. Gain: 76.2bhp and 465.9lbft at the axles. This image shows flywheel torque (lbft) and AFR. The torque produced at the flywheel will be displayed on the left hand side of the page. The right hand side of the page shows the air-fuel ratio. This car was running extremely lean throughout the entire rev-range. The car drives a lot smoother through the revs and has more torque and power. Finally, here is the boost graph. Here are the results for Alan Lenihan’s S13 drift car that was in for mapping today. It was mapped on a Motec M4. We have done a before and after comparison with the previous map from Tuner X. N.b. The thin red line represents Tuner-X’s map and the larger line represents TDP’s map. Gain: 57.6bhp and 175.7lbft at the axles. This image shows flywheel torque (lbft) and AFR. The torque produced at the flywheel will be displayed on the left hand side of the page. The right hand side of the page shows the air-fuel ratio. This car was running extremely rich throughout the entire rev-range on Tuner-X’s map. The car drives a lot smoother through the revs, has more torque and power and is far more fuel efficient now that it has a TDP map. 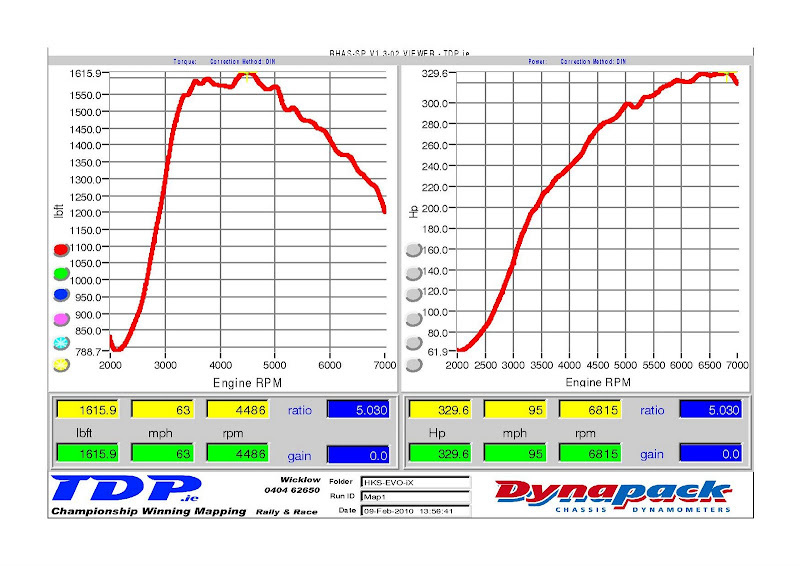 Finally, here is the boost graph. As you can see, the boost hasn’t been raised at all. 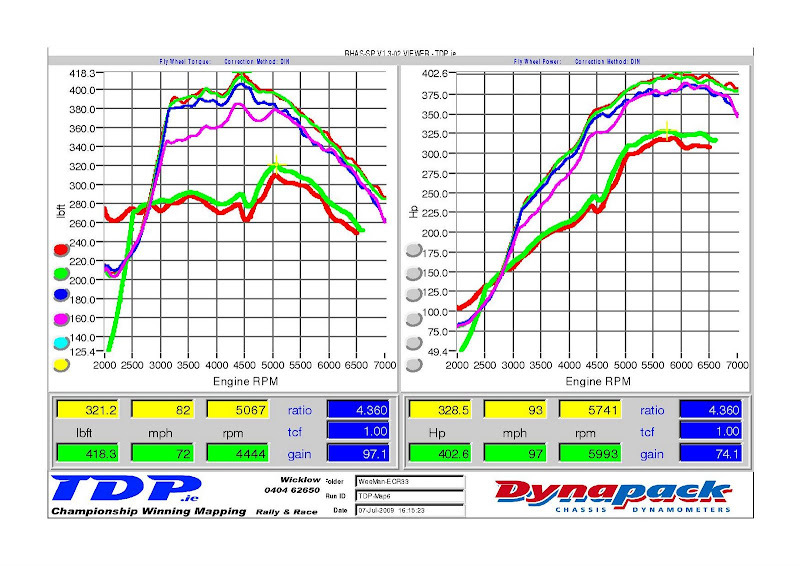 Here are the results for a Nissan Skyline R34 GT-R that was in for mapping today. This Skyline had breathing mods and an aftermarket fuel pump. It was mapped on an Apexi Power FC. 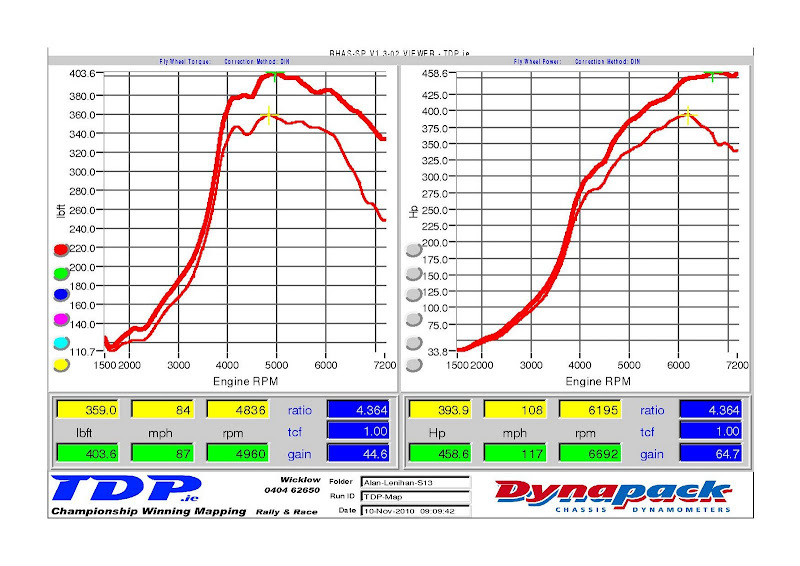 Unfortunately, we couldn’t do a before and after comparison as the car was detonating too much on its previous map. This image shows flywheel torque (lbft) and AFR. The torque produced at the flywheel will be displayed on the left hand side of the page. The right hand side of the page shows the air-fuel ratio. Here are the results for an EVO V that we had in for mapping. This Evo V is fairly standard with just some light breathing mods. We suspect that ecu was chipped in Japan. 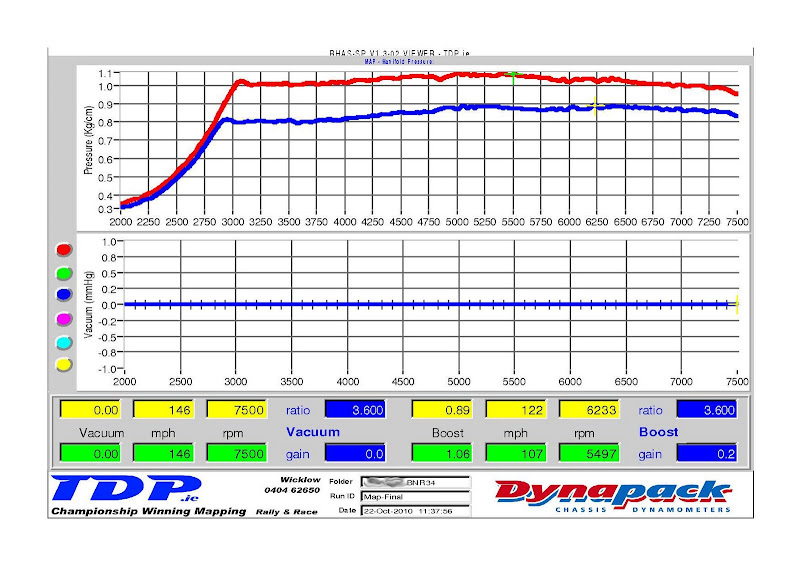 We mapped it on its standard EVO V ecu. 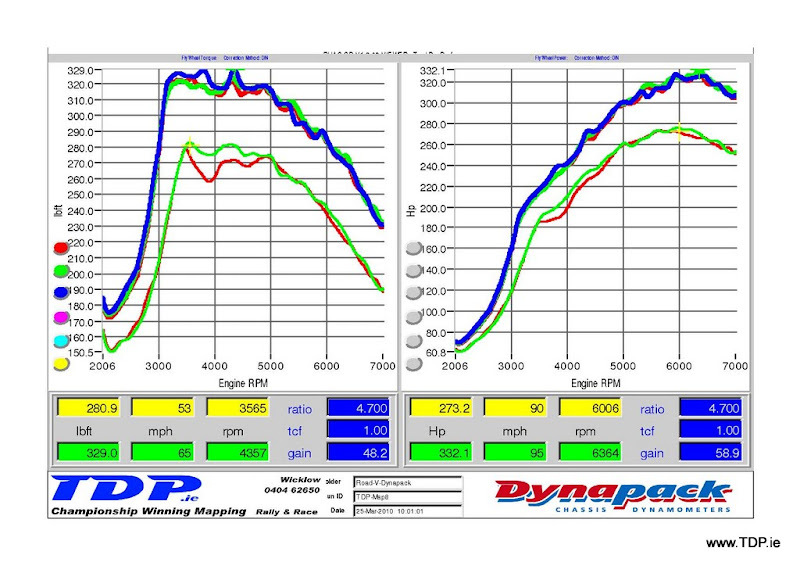 * Please note, in the below graphs, the green and red lines on the graph represent the car’s performance before we mapped it. 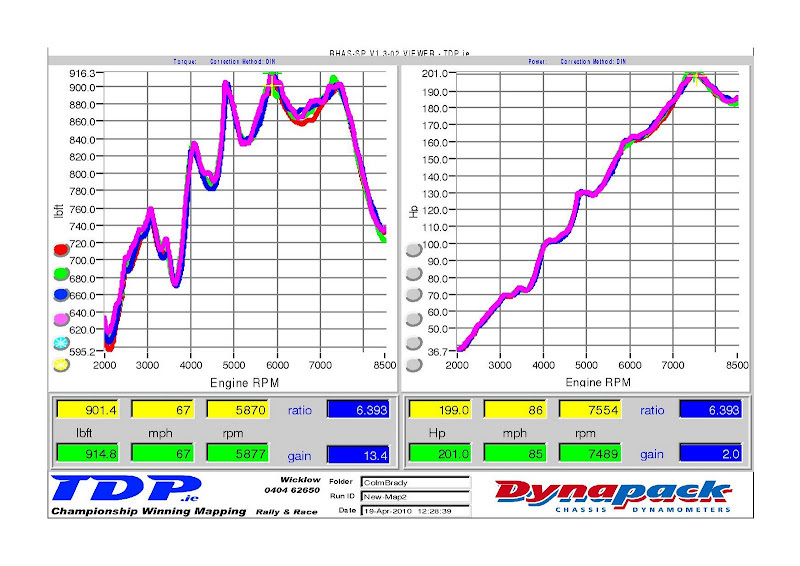 The pink, blue, yellow lines represent how the car performed after being mapped by TDP. Gain: 19.7bhp and 226.5 lbft at the axles. This image shows flywheel torque (lbft) and AFR. The torque produced at the flywheel will be displayed on the left hand side of the page. The right hand side of the page shows the air-fuel ratio. This car was running extremely lean when it arrived here. It was running a high risk of doing some serious engine damage. The car drives a lot smoother through the revs, has more torque and power and is far more fuel efficient now that it has a TDP map. Finally, here is the boost graph. 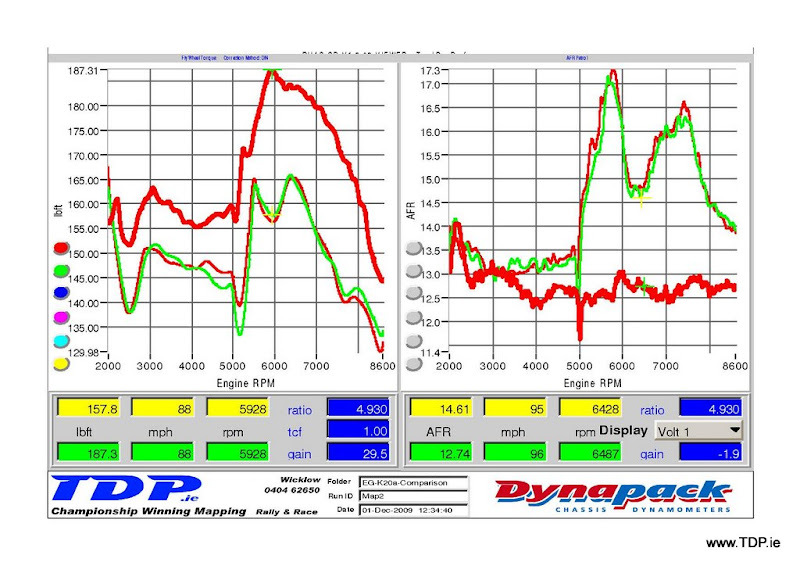 The car comes on to boost sooner as it now has a much better fuelling map. Here are the results for an EVO VII that we had in for mapping. The new owner was unhappy with the previous (road) map that was on the car, as it was running very badly and was giving horrendous mpg. This Evo VII is fairly standard with just some light breathing mods. 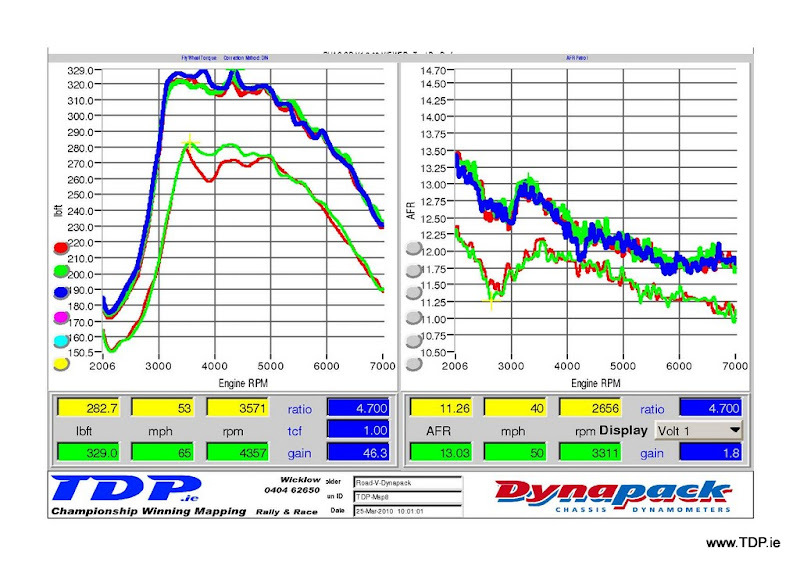 The car was mapped on its standard EVO VII ecu and the boost was not raised. * Please note, in the below graphs, the green and red lines on the graph represent the car’s performance on TunerX’s map and the blue, green and red lines represent how the car performed after being mapped by TDP. Gain: 30.7bhp and 103lbft at the axles. This image shows flywheel torque (lbft) and AFR. The torque produced at the flywheel will be displayed on the left hand side of the page. 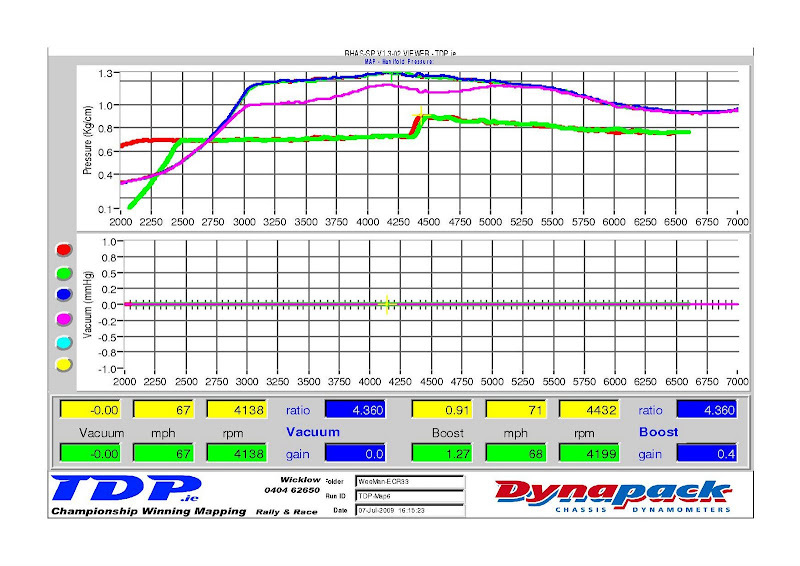 The right hand side of the page shows the air-fuel ratio. This car was running extremely rich, particularly at low RPM on TunerX’s map. The car drives a lot smoother through the revs, has more torque and power and is far more fuel efficient now that it has a TDP map. 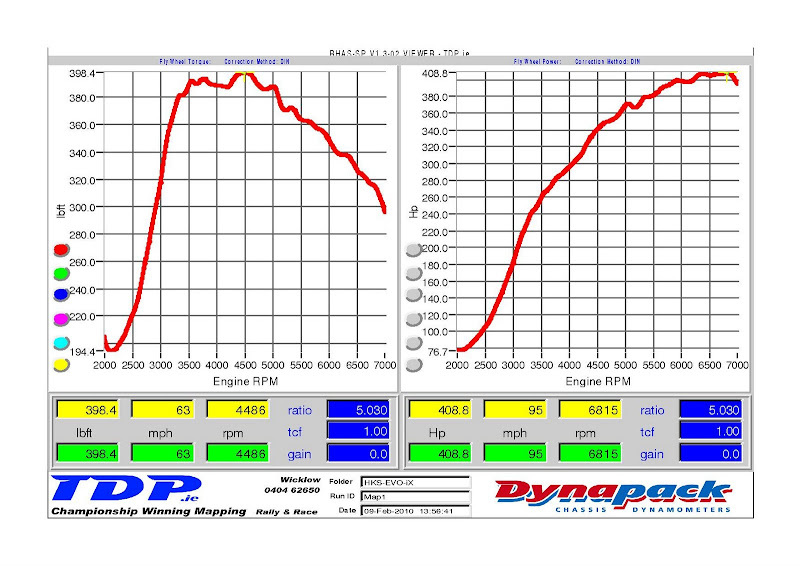 Finally, here is the boost graph. As you can see, the boost hasn’t been raised at all. 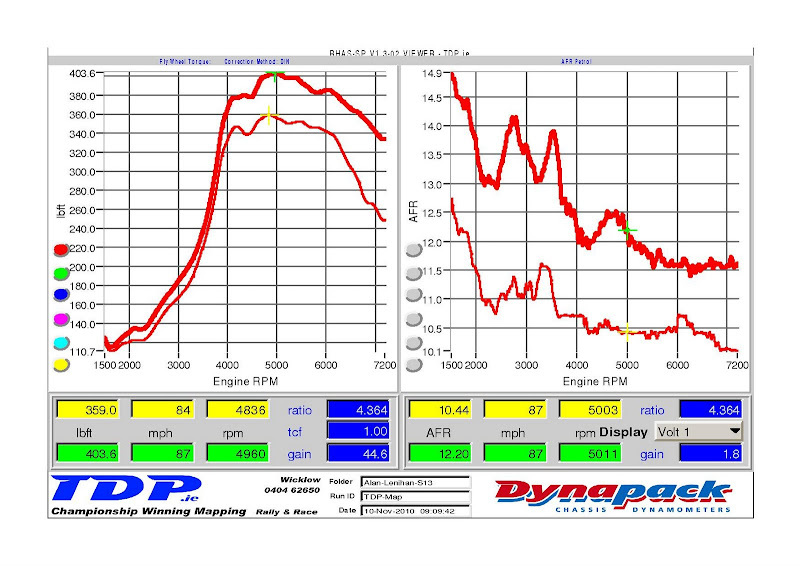 The car does come on to boost sooner though, this is because the car has a much better fuelling map on it now. 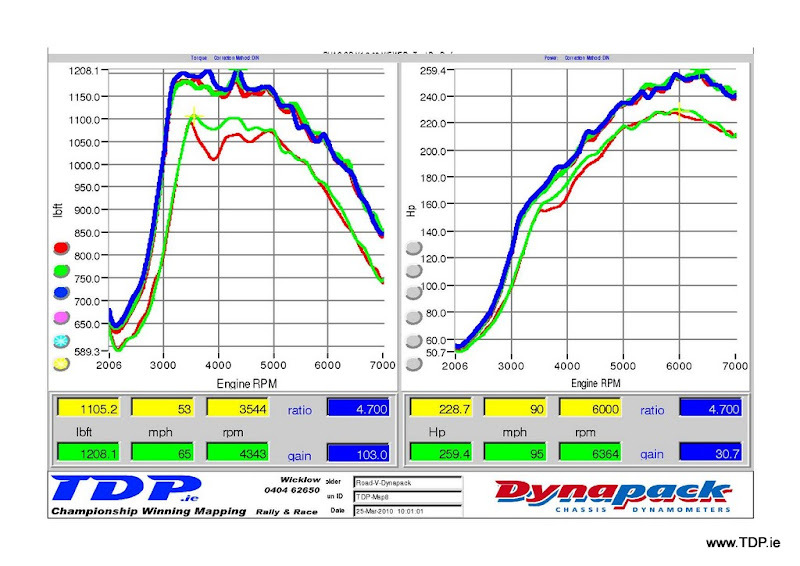 Here are the results for a Civic rally car that we had in for mapping. The spec was as follows: Omex ecu, Wossner pistons, TDP built head, TDP throttle bodies and cams. Today, we had a lovely EG Civic in for mapping. But following a K20 engine conversion, it appeared to be running on a base map on its Hondata K-Pro ecu. We were shocked to see how lean it was running on vtec. We are posting this to warn people that uploading base maps to their K-pro could potentially be very dangerous for the engine. Firstly, here’s the car on the Dynapack. This Image is of the torque (lbft) and power (bhp). These figures are accurate to within +/- 0.1 %. Basically, this is the axle torque (left hand side) and axle power (right hand side) measured at the hubs. The figure for axle torque will be quite high (781.6lbft in this example). It is the ‘true torque’. It is calculated by: the torque produced at the flywheel multiplied by the gear ratio and the final drive ratio. The power figure is the power produced at the axles. This image shows flywheel torque (lbft) and power (bhp). This is the torque (left hand side) and power (right hand side) that is produced at the flywheel. These figures are estimated and are correct to ± 5%. The final image shows flywheel torque (lbft) and AFR. The torque produced at the flywheel is displayed on the left hand side of the page. 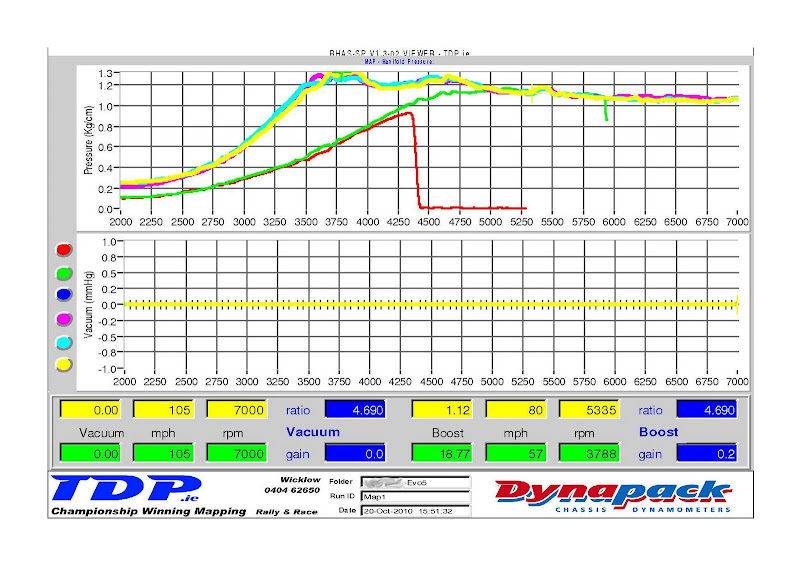 The right hand side of the page shows the air-fuel ratio. 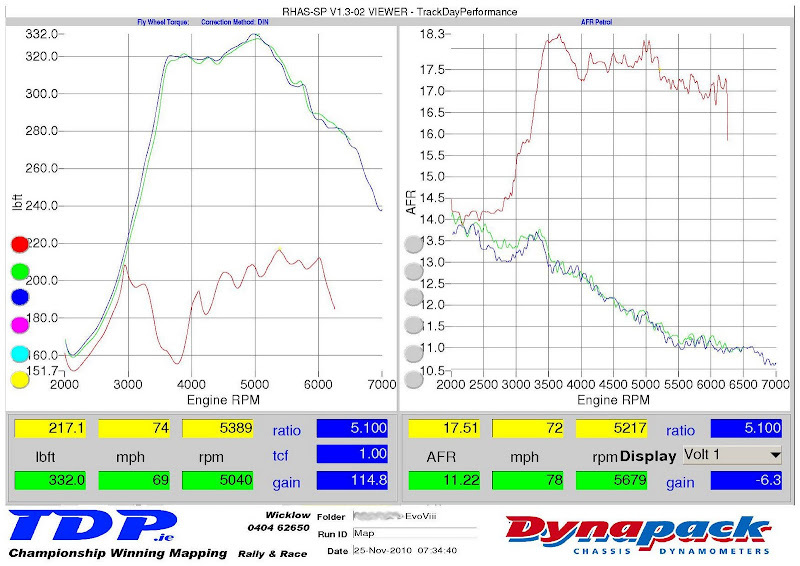 As you can see in the AFR graph, the engine was running EXTREMELY LEAN. It was just a matter of time before serious damage was done to this engine. 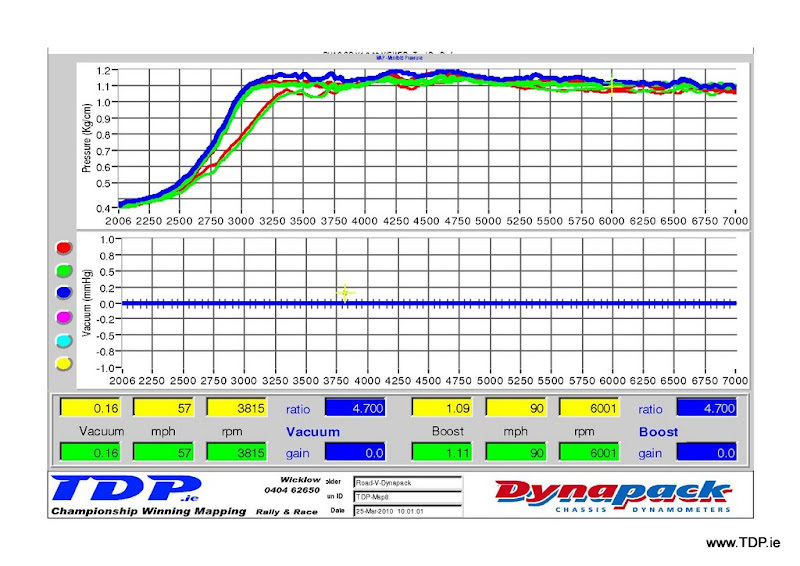 Following the map, the car is now running with extra torque and power, and most importantly, it’s running safely. 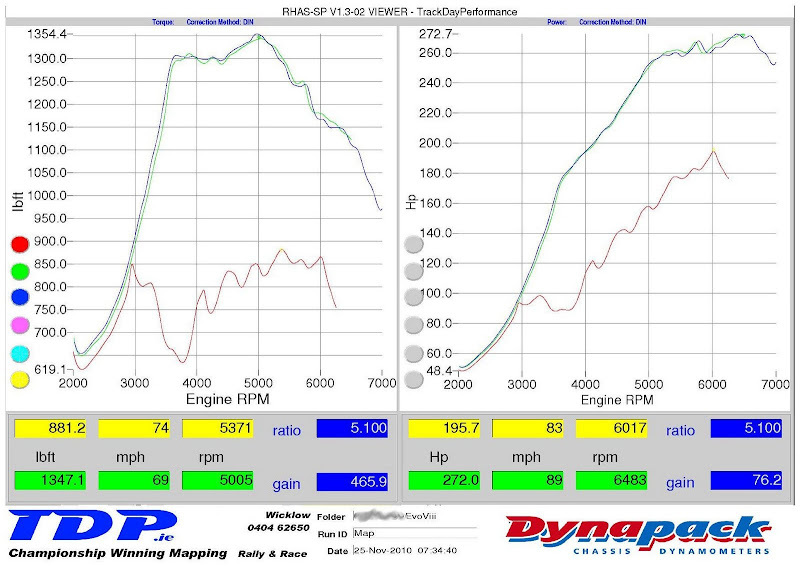 Here are the results for Elmo’s Time Attack Civic. We ran it up on the Spoon B18 Type R ecu that he used in the last round. We ran the engine and transmission up to temperature and took a few power readings on the Spoon ECU, so that we had a good base line to work from. Then we made up a simple adapter loom to allow the MoTeC M4 Ecu to work as a Plug and Play unit. After two hours of mapping and tweaking, we were happy with the figures and improvements made. The first image shows the torque (lbft) on the left hand side of the page, and power (BHP) on the right hand side of the page, measured at the hubs. The torque figure is the ‘true torque’. It is calculated by: the torque produced at the flywheel multiplied by the gear ratio and the final drive ratio. The power figure is the power produced at the axles. 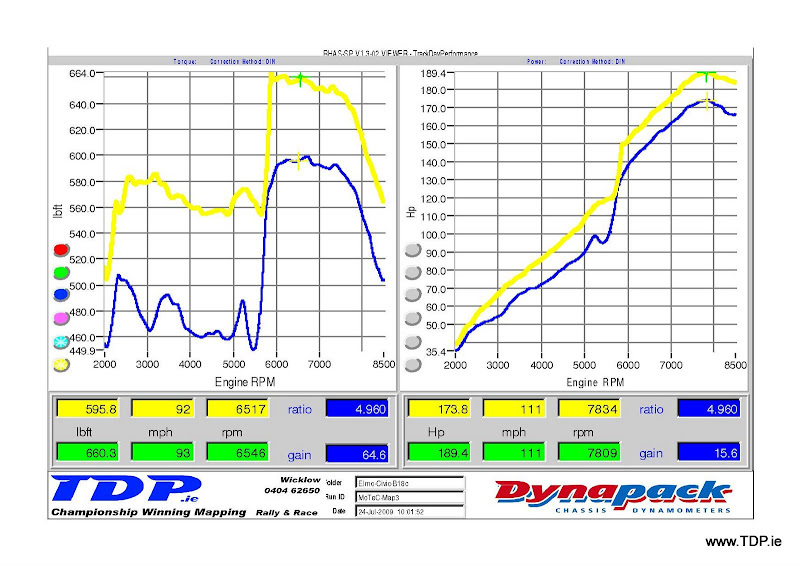 The blue line represents the Spoon Ecu and the yellow is form the MoTeC ecu mapped on the Dynapack. The second image shows flywheel torque (lbft) on the left hand side of the page and flywheel power (BHP) on the right hand side. As the title suggests, this is the torque and power that is produced at the flywheel. These figures are estimated and are correct to ± 5%. 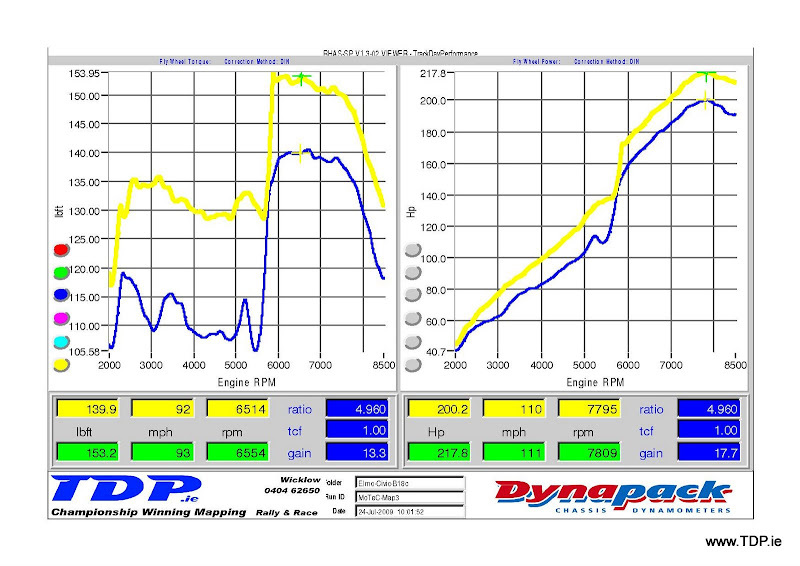 The blue line represents the Spoon Ecu and the yellow is form the MoTeC ecu mapped on the Dynapack. The final image shows flywheel torque (lbft) and AFR. The torque produced at the flywheel is displayed on the left hand side of the page. The right hand side of the page shows the air-fuel ratio. 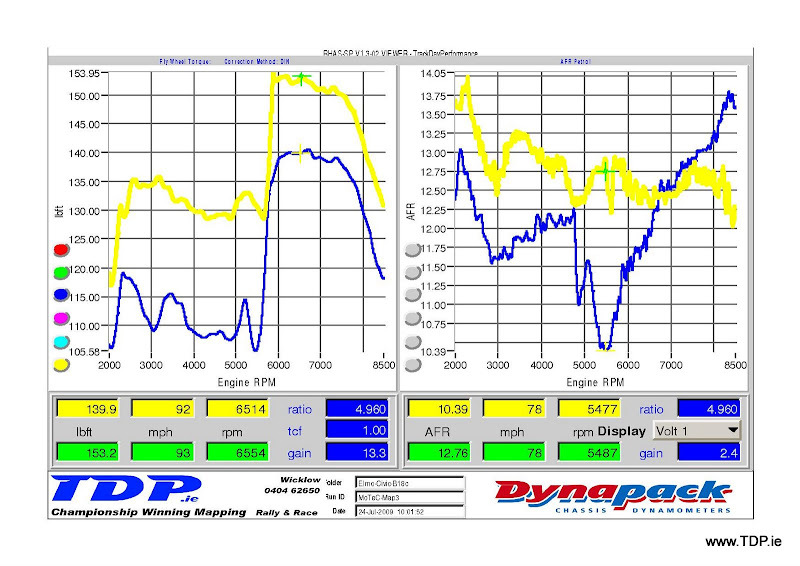 The blue line represents the Spoon Ecu and the yellow is form the MoTeC ecu mapped on the Dynapack. 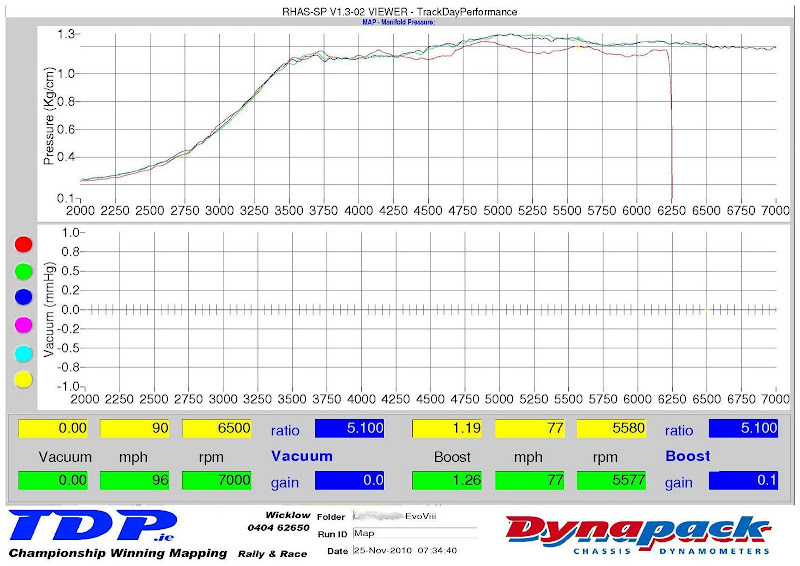 Here are the results for an R33 GTS-t Skyline drift car that was tuned at TDP using a Power FC. The car has the following modifications: full turbo-back exhaust, air filter, front mount intercooler, Z32 air flow meter, a hybrid turbo and an Apexi Power FC. This car was previously mapped by another Irish tuner. 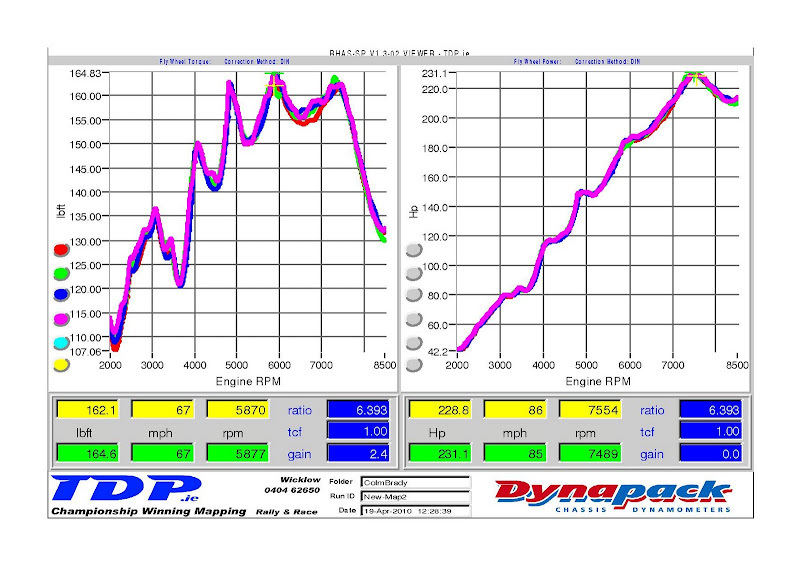 We have remapped it and made big gains with no mechanical alterations. Robbie’s years of experience mapping cars are clearly shown in the below comparison. The dotted red and green lines are the TDP map. 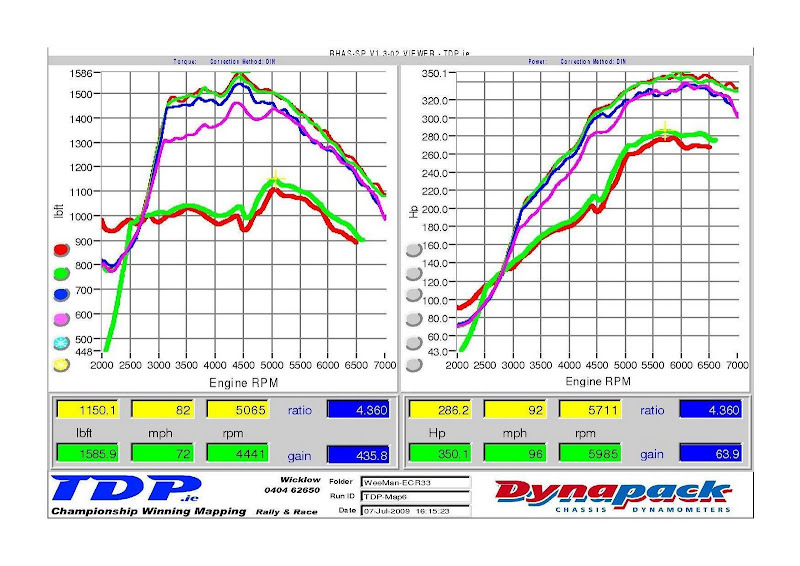 The purple dotted line is the TDP low boost map. 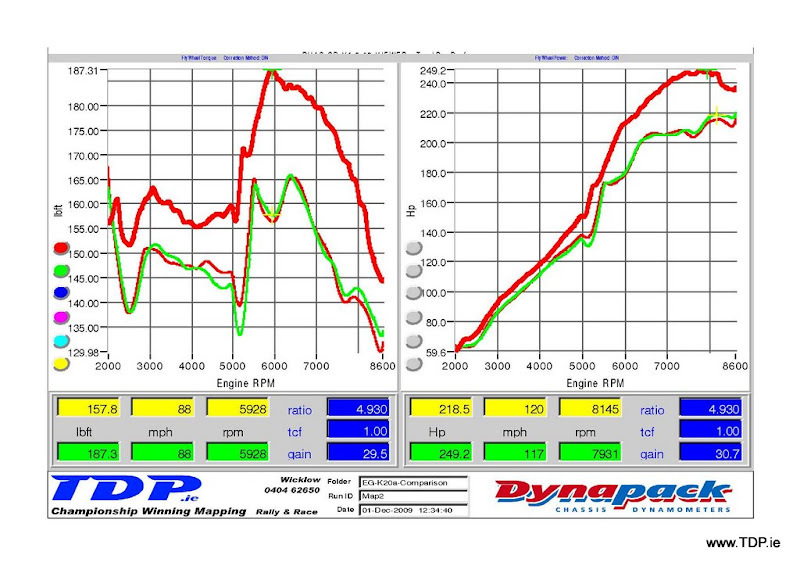 The dashed red and green lines are the TunerX map. 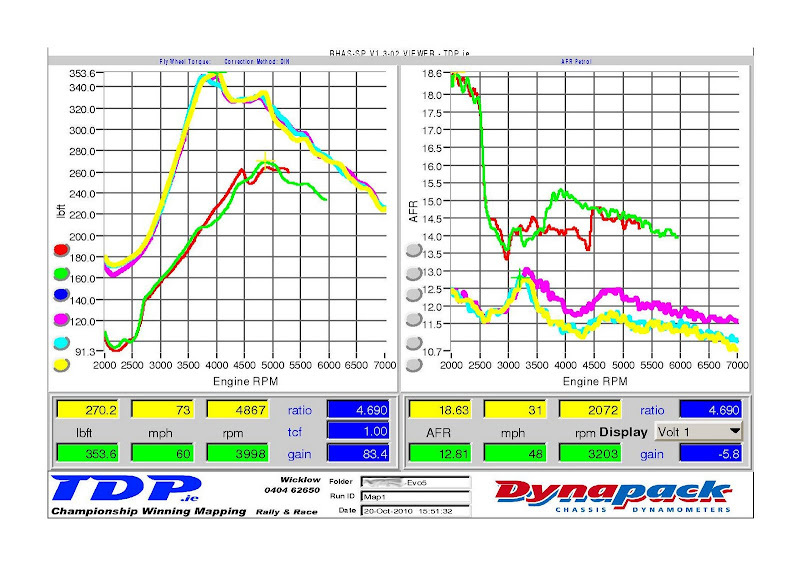 The dashed red and green lines are the TunerX map. 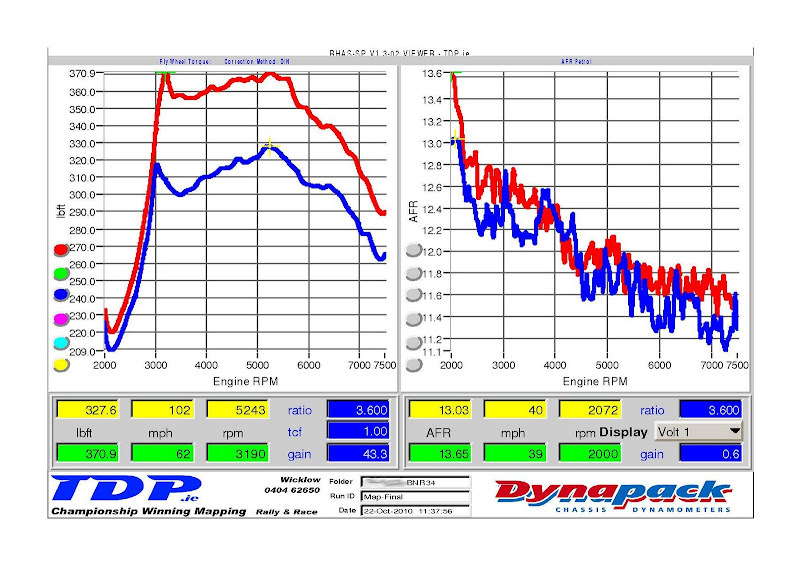 As you can see, at peak torque, TunerX’s AFR readings were ready to melt a piston. The final image shows the boost pressure. Here are the results for the HKS Evo IX that we mapped for one of our customers. The first graph shows the torque (lbft) on the left hand side of the page, and power (BHP) on the right hand side of the page, measured at the hubs. The torque figure is the ‘true torque’. It is calculated by: the torque produced at the flywheel multiplied by the gear ratio and the final drive ratio. The power figure is the power produced at the axles.